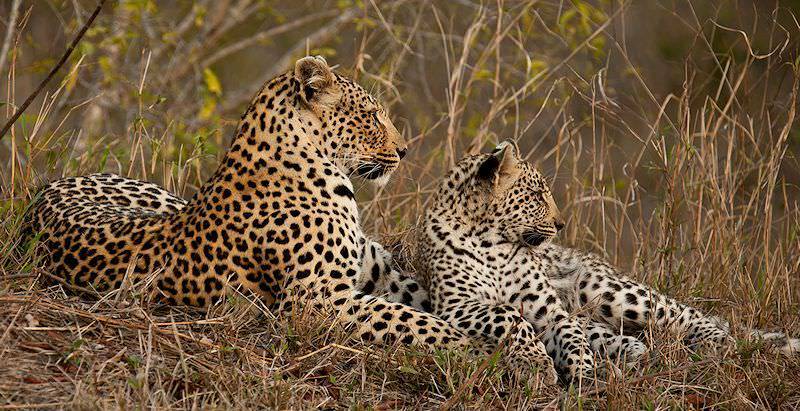 The leopard is one of continent's most breathtakingly beautiful big cats and an esteemed member of the Big Five. Leopards are another of Africa’s larger felines, with the average weight of African leopards ranging between 30 and 40kg (about 60lb to 90lb) in females, and about 60kg (130lb) in males, among most of the different subspecies found in Africa. They are easily identified by their dotted coat of fur, and their more stocky build compared to that of cheetahs with which they are regularly confused. The spots on their coat are bigger and have a black outline and a brown inner part compared to the smaller, solely black spots of Cheetahs. Male and female leopards aren’t easily distinguished, with the only real prominent difference between the two being their respective sizes and whether or not they are looking after cubs. Leopards are found throughout Sub-Saharan Africa and are quite adaptive to changes in environment and habitat. For the most part, they prefer areas with higher rainfall, but also find refuge next to rivers in areas which don't necessarily experience high rainfall conditions. They can be found just about anywhere in Southern Africa, along with the coast, in the Drakensberg Mountains, in the Kalahari Desert and most certainly in the Kruger National park, as well as its surroundings. The luscious bush found in the Southern part of the Kruger National Park is an area where these odd animals have been seen regularly, along with the more mountainous and dense northern part around the Rest Camps of Letaba and Shingwedzi. Leopards are quite common and are one of the few sub-Saharan animal species that have not been affected as much by habitat loss and quarrels with people, in comparison with other big cats and predators in Africa such as cheetahs, lions and wild dogs, although historically they were more widely spread in regions now used for agriculture or housing. The secretive nature of their lives has kept them out of harm's way for the most part and has greatly contributed to their survival and adaptiveness to change. You might not easily come across a leopard, but this is definitely not due to their population, which is estimated at over 700 000 in Africa. These very adaptive predators are quite widespread and utilize any habitat or ecosystem to survive, while also being found in most Southern African habitats where prey is available. Because of their strong climbing capabilities, they are mostly found in and around habitats with trees or caves fit for shelter, near a water source of some sort or in habitats with high rainfall. They coincide with Lions most of the time, but are also found where Lions are not, in the Congo rain forests for example. They can also live off smaller pieces of land and hunt smaller prey to survive, unlike Lions and other predators who live in groups. Leopards are again very different from Lions in the sense that they do not form any groups or communities. They live alone in isolation and are very territorial, with territory sizes varying in size, in the Kruger National Park being 1 square kilometer for example. They have different skill sets than other big predators and wouldn’t be able to compete for prey if they lived on the ground in the grassy plains of Africa, simply because of their size and their lack of groups. This is a good reason why they are better off in the trees, silently lurking in the shadows. Leopards are very peculiar cats. Mothers raise cubs alone; coming into contact with males only for breeding purposes. Mothers may continue to see and socialize with their cubs even after they aren't dependent on their mothers for food and shelter anymore at roughly 22 months of age. Males, on the other hand, only come into contact with other leopards when there is a dispute over territory and prey. Leopards often vocalize though, whether it be to scare off baboons and other pests, or when 2 males shout at each other from their respective territory borders. Males go in search of females during mating season, when females leave their sent for males to find during a week-long period when females are in heat. In some cases, this period may be year round depending on climate patterns and rainfall. Their mating rituals begin when a male finds a willing female. They then, like lions, mate roughly every 20 minutes for days on end to create the highest possibility of the female leopard being impregnated. If breeding is successful, the mother will carry her litter for 90 to 105 days, after which they will be born, usually about 2. The biggest enemy for leopards in Africa are lions. The main issue leopards have with other species to classify them as an enemy are disputes and battles over food. A 50kg leopard is no match for a 120kg lion, and on top of that lions organize themselves in prides, which can easily steal food from a leopard. Hyenas, both spotted and brown, pose the same problem for the survival of leopards in regards to obtaining food and keeping it for as long as possible. The other great enemy of the leopard is the baboon. These two fight over territory, although smaller baboons are more prey than an enemy in the eyes of most leopards. South Africa offers a wide variety of vacations for discerning travelers. Travel to Botswana for unforgettable water-based safari activities. Namibia's top destinations include Etosha National Park and Sossusvlei. Zambia's wilderness areas are captivatingly wild and remote, from Kafue to South Luangwa. Travel to Zimbabwe for a bewitching view of the Victoria Falls. Mozambique's top destinations are the Benguerra and Quirimbas archipelagos. The Greater Kruger National Park stretches across almost two million hectares of South African wilderness. The Sabi Sand forms part of an exclusive collection of private game reserves on the Kruger Park's western border. Cape Town is South Africa's oldest and most beloved city, offering a wealth of thrilling adventures for visitors. The Garden Route is a lush coastal Eden in South Africa's Southern Cape region, known for its stunning scenery.